Tankless Water Heaters vs Traditional Water Heaters: How to Choose? These days, many people think that buying a tankless water heater is best because it represents new technology. In fact, the better equipment to buy depends on the property. And, one is not necessarily better than the other. By exploring cost, installation and efficiency, A. Borrelli Residential & Commercial HVAC Services helps you determine which water heater you should purchase. The initial investment conveys the biggest difference between tankless and traditional water heaters. Largely because they are innovative technology, tankless water heaters cost significantly more. Consumer Reports notes that tankless water heaters cost as much as 2-3 times the cost of a new tank water heater. You should take this information into consideration when you balance the cost of the new appliance with the energy savings you might get. Tankless water heater manufacturers estimate that you can save as much as 50 percent of your energy consumption on heating water with a tankless water heater. Given an average lifespan of ten years for a water heater, this may account for significant savings for your property, depending on your consumption. Just as the cost of the equipment is higher for a tankless water heater, so the installation is also generally more expensive. However, new construction and remodeling present potential advantages to the tankless water heater. Since there is no need for a tank, tankless water heaters are smaller. They may be installed in tighter spaces, in rooms where you did not previously have a water heater. If construction is not complete, you can account for plumbing alterations or upgrades within the scope of your general plumbing updates. At A. Borelli Mechanical, we are skilled in the conversion to a tankless water heater system, and can help you determine your installation needs, based on the property. 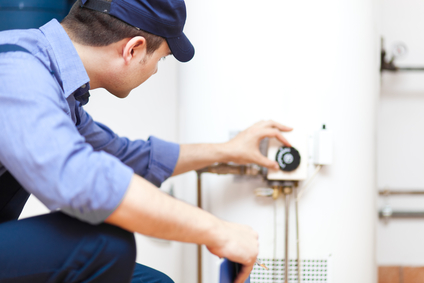 The overall efficiency of water heaters depends tremendously on their use. In theory, tankless water heaters always deliver hot water on demand. However, this requires a fairly significant investment of available energy used by the water heater immediately. Some homes are not equipped to provide that energy at once, particularly homes running exclusively on electric energy. However, if you use a lot of hot water throughout the day, you may find that a tank water heater is not suitable for your needs, either. One of our qualified plumbers can discuss with you the energy efficiency you can expect from a new water heater. You may determine that a tankless water heater is ideal, or that a water heater with a larger tank is best for your needs. The type of water heater that will be the most cost-efficient and energy-efficient for your property does not rely on the age of the technology. Your arrangement is unique, and changes the balance of benefits in favor of a tankless water heater or a traditional tank water heater. With expert advice and installation from A. Borrelli Mechanical, homeowners in the Westchester County and New York City area make wise buying decisions on plumbing equipment.